This irresistible gift box is a delightful display of gorgeous autumn colours including reds and golds, plus a stunning selection of russet and orange tones. They’re sure to adore the gift box too – and it makes a pretty keepsake that’s just perfect for storing all sorts of knick-knacks. 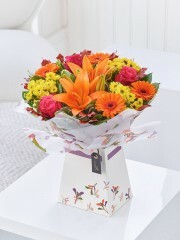 Featuring an orange LA lily, yellow spray chrysanthemum, orange germini, cerise roses with salal, oak leaves and pittosporum, presented in a gift box. 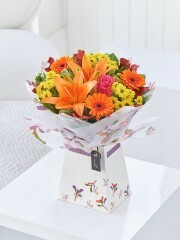 Featuring an orange LA lily, yellow spray chrysanthemums, orange germini, a cerise rose with salal, oak leaves and pittosporum, presented in a gift box. Includes 115g Box Belgian Chocolates. 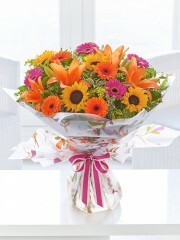 Stonehaven Flowers offer an extensive range of seasonal flowers. 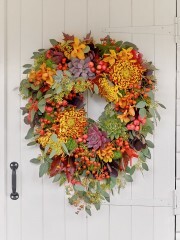 After the bright and lush colours of the summer season, the rustic colours of Autumn are here. 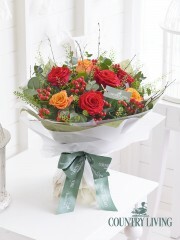 Beautiful autumn reds and golden oranges are beautiful in a hand-tied bouquet along with the stunning yellows and deep, rich browns that Autumn has to offer. 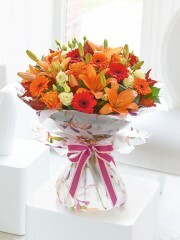 The exciting colours of this season make any bouquet stand out. Florists Stonehaven produce some of the most amazing bespoke bouquets. Each bouquet can be tailored to your preferences or that of the person you have in mind. 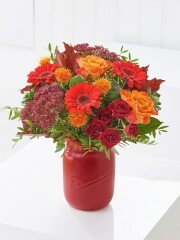 An Autumn arrangement is the most wonderful surprise for a loved one and can bring beauty to the season. 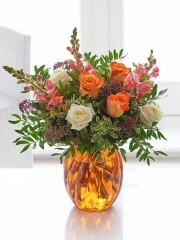 These flowers are all delightful and reflect the rich warmth of the Autumn season. The Expert Florists Stonehaven are on hand to help with your every need, whether that be choosing the flowers for your bouquet or the message you wish to include. 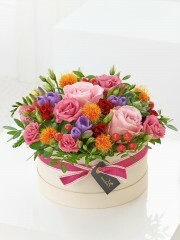 Each bouquet is made with the utmost skill and care to ensure they are perfectly arranged and styled. Stonehaven flowers aim to provide you with a service of excellence, ensuring that you and your loved one receive nothing other than the highest levels of satisfaction when receiving your flowers. 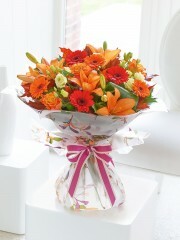 Autumns vibrant colours will make any flower arrangement spectacular and can create that long lasting impression. With their extensive experience Stonehaven florists know exactly how to achieve the best quality standards of work and complete each order to your specific requirements. If you wish to make your bouquet just that little extra special, each arrangement can be accompanied by a selection of gifts. May this be a delicious box of fine chocolates, or your bouquet in a gift bag accompanied by one of our exquisite selections of champagne or wine. 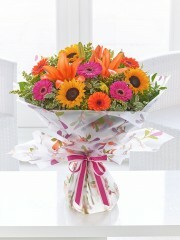 A variety of our bouquets by Stonehaven flowers come with a vase included. For an all the more delightful Autumn gift, you can arrange to have a selection of gourmet Autumn foods included in your order. If you cannot find what you are looking for through our extensive online range, you can ask our expert Stonehaven florists to provide you with advice and produce an amazing bouquet down to your specific needs. Our florists at Stonehaven flowers are delighted to help you with your order to make dealing with us an enjoyable as possible. No matter what the occasion, be it an engagement or wedding gift, sending these amazing seasonal flowers can bring delight and joy to any loved one. 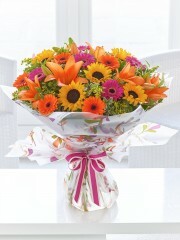 These Autumn flowers are simply a stunning gift that replicates the vibrant time of the year. Our flower delivery Stonehaven service offer a fantastic range of delivery options including our standard next day delivery that can be available Monday through to Friday. 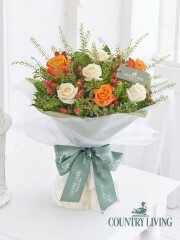 Furthermore, our delivery drivers at Stonehaven flower delivery provide an exceptional Same Day Delivery service. This allows you or the one you have in mind to receive your gorgeous bouquet or gift on the same day as ordering provided that it is ordered before 3pm. Stonehaven flowers always aim to please each and every customers, and with these delightful rustic colours of the Autumn season, our expert florists at Stonehaven florists have no doubts that these would create an impact to any room and be the picture-perfect gift for any individual.